№23548817 Mad vikings warriors posing in studio on dark background. 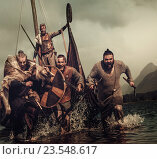 №23548617 Mad vikings warriors in the attack, running along the shore with Drakkar on the background. №24117579 Iran, Fars Province, Persepolis, World Heritage of the UNESCO, staircases of Apadana, releif of the warriors.